In these days before Valentine’s Day, if you are wondering what in the world you will treat your kids to (or yourself) that is at least a little bit healthy, here’s a project that you can use along with the Valentine’s drink I posted the other day (here). I’ve got a picture right here because, frankly, you don’t need a video or how-to blueprint to pull this one off. 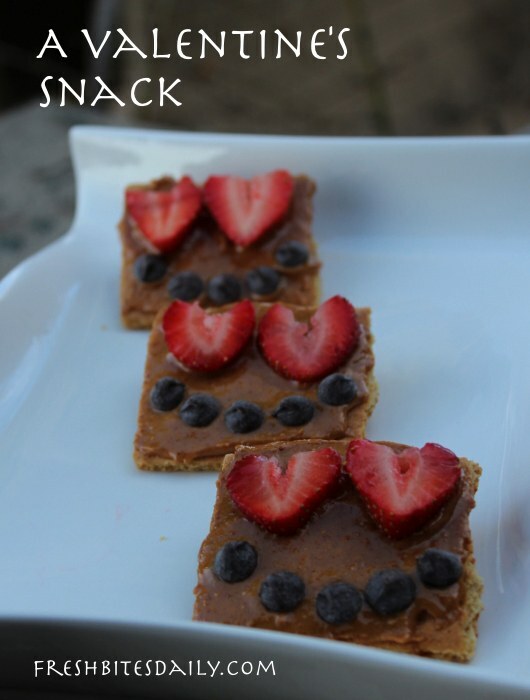 Grab some crackers, peanut butter (or other nut butter), chocolate chips (or raisins), and strawberries. Slap it together. The real reason for making this video is that Alastair loves to be in these videos by himself and what he ends up making is always a little on the crazy side, so here’s more Alastair. There are related outtakes that I’ve actually removed from the video, just so that I am not responsible for soiling the minds of young children everywhere. As we shot this video, Alastair continued to mess up the pronunciation of “Graham cracker.” It came out “Graham crapper.” He caught himself and laughed a raspy laugh. Yes, he knows what it means.